How to draw crane in different ways? 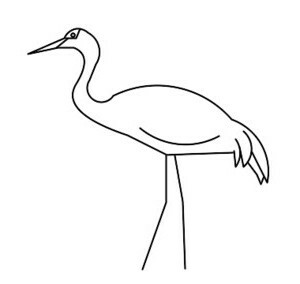 Sometimes a man wants to do something unusual, for example, to draw a crane. But to satisfy their desire, it is sometimes very difficult. After all, no skill, and where to start is not always know. 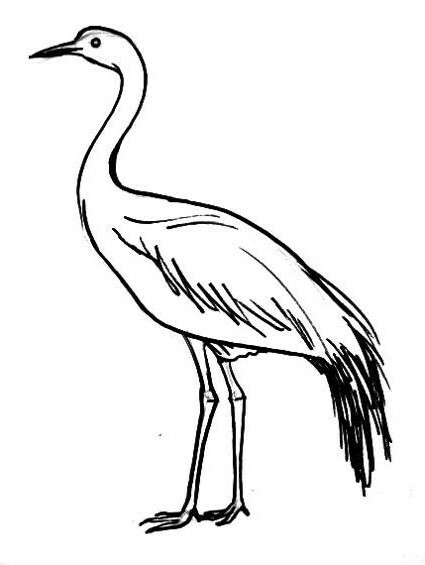 In this article we will tell you how you can easily, and most importantly, fast to draw a crane for the beginner or child. Child has their vision of the world, and it is to be understood. But in his work he should not ignore the canons of the image. 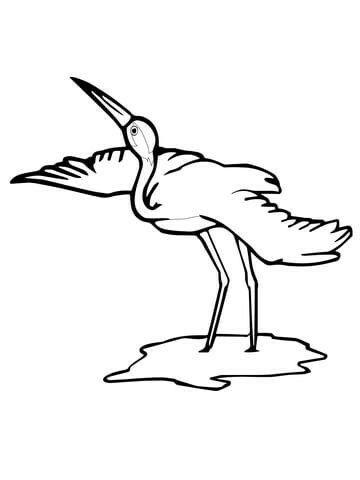 How to draw a crane in stages? That's what we analyze. The first thing we need to identify the bird. This can be done with an oval or just to draw the outline. Don't worry, if the neck is too long or legs too skinny. This will be fixed in the future. When the primary circuit is ready, the planned parts: wing, tail feathers. This is necessary in order to draw a pie with pencil realistic, because if you do not, it may be a situation, when the wing just didn't fit in the body. Sketch is ready, start refining the form. At this stage, you need to make the neck of the bird is longer and the torso more elegant. We will increase the bird's tail and feet make thicker. It remains to add feathers on the wings and work out the details of the head. to Draw the bird we will be on the same lines, that worked in the previous paragraph. First you need to draw a pie in the form of a loop. Also planned from the water in which the bird stands. In the second stage, when we come to the refinement of the components may be a problem with the image of wings. It's hard to draw the same. It is not necessary to strive for similarity. The feathers on the wings may lie in different ways. And remember, the wing that is far away, behind the neck of the crane, will be less in 2 times than that which is in the foreground. Water is optional to draw, just her outline. And lastly working out the details. Here you need to outline the line that separates the wings from the body, to draw the feathers, and also to draw the details of the head, beak, and eyes. If you don't need to paint a realistic bird, then you can dream up. 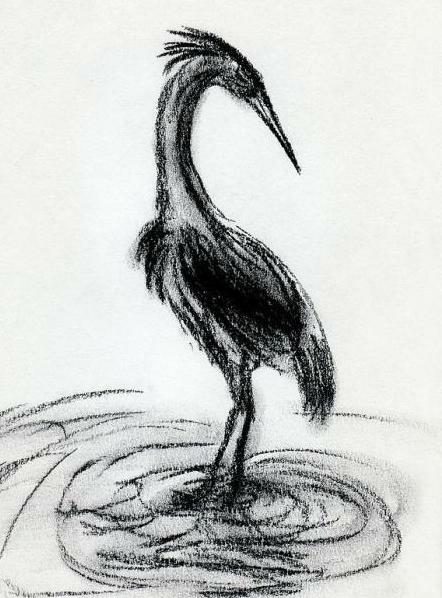 For example, paint of a crane in a stylised form. How to do it? First you need to draw the outline of a bird. Despite the fact that we have it is unrealistic, it is still the silhouette has to be recognizable. Once the outline is ready, begin to fill it. The parts to separate from each other, use different tilt patterns. For example, the body twists can be located exactly, but on the wings and tail they must be in a different location. Pay special attention to the neck. It does not need to be shortened, because you can get a crane and a duck. Legs drawn thick sticks with sharp tips. Don't forget to mark the line of your knees. Draw eyes and beak, and added small parts in the form of points. Before you paint the bird with coal, you need to make a sketch. How to draw a crane with a pencil step by step, we discussed in the first paragraph, and now look at how to work with soft material. You need to work quickly so as not to bring on a sheet of mud. Start painting from the top down. Being the head, the beak neck. First barely press on the crayon, and then trace the resulting contour is a thick line. On the head of the intended crest, and the neck – a shadow. To give the drawing volume, slightly RUB the charcoal with your finger. Moving on to body image. 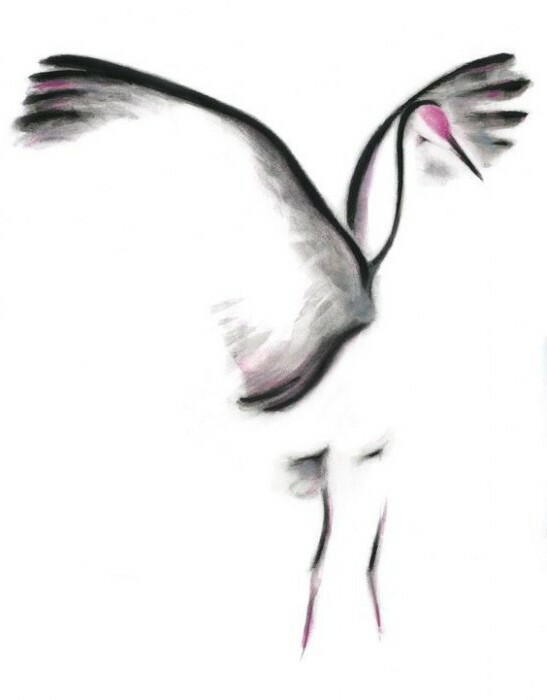 First, the torso of a crane doing a gray, bold lines to draw the wings and tail. Strokes can show the feathers on the chest and neck. Two thin lines of the planned legs. The last action – represented the water surface. Not always in order to draw a picture, we need to draw all the details. Sometimes it is enough to outline the most important parts of a bird. The brain alone will add a picture. Try to draw the crane in this technique. If the images are unusual, do not despair, start will still have full prorisovany contour of the bird. Because otherwise you may get out of proportion, and then the brain will not be able to finish your part of the job. 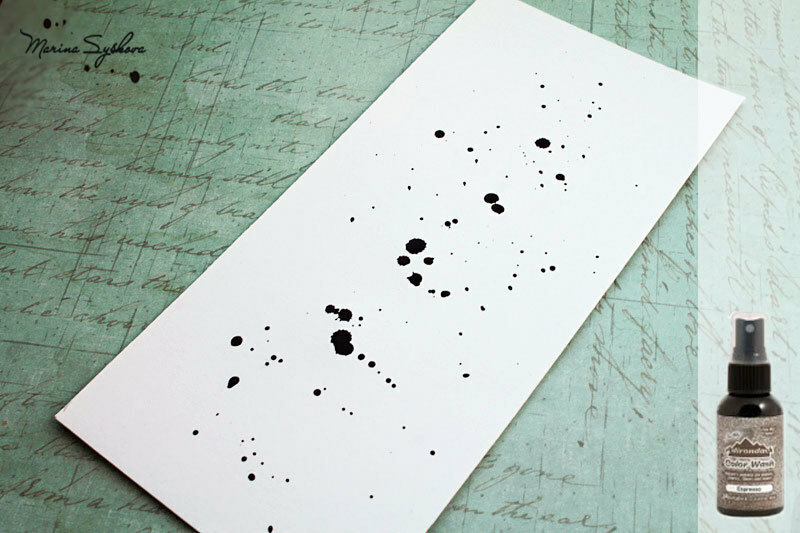 After drawing the sketch, you can begin applying the stain. You should start with the lightest color, in our case grey. To them, we draw the inner part of the wings and outline the tail. Now take a black pastel or charcoal and draw out the circuit. The line should be soft, it can in some places be interrupted. In our case, we do not draw the lower part of the bird denoted by the legs. Final action – placed colored accents. Put pink spots on the head, legs, wings and a little rubbing pink in the body. Remember that accent color must be single and preferably do it on the head. All other spots must not get out, they go into the background. Optionally the muzzle you can give even more realism, adding the eyes and beak, clearly loomed.